If you’re looking for a compact, versatile telephoto zoom lens that handles portraiture as well as it handles long-distance wildlife and action photography, look no further than the AF-S NIKKOR 80-400mm f/4.5-5.6G ED VR. With the broadest focal length range in our super-telephoto zoom line-up, it reduces the number of lenses you need to carry into the field; and expands your handheld shooting capabilities, thanks to Nikon’s Vibration Reduction (VR) technology. Create spectacular photos and HD videos in nearly any light, from nearly any distance. Listen to Nikon Ambassador Moose Peterson talk about his favorite lens. Travel light. Shoot with confidence. The AF-S NIKKOR 80-400mm f/4.5-5.6G ED VR covers the broadest focal length range of any NIKKOR super-telephoto zoom lens. At 80mm, its an ideal medium-telephoto portrait lens. Create stunning portraits with a medium telephoto perspective and softly blurred backgrounds. At 400mm, its a powerful super-telephoto lens suited to wildlife and action photography. For dazzling close-ups with macro detail, get as close as 5.7 feet from your subject and zoom in to 400mm—you'll be amazed by the results! At super-telephoto focal lengths, even the slightest camera movement can cause image blur. Fortunately, the AF-S NIKKOR 80-400mm f/4.5-5.6G ED VR features Nikon's second-generation Vibration Reduction technology to ensure every handheld photo and HD video is razor-sharp. Nikon VR (Vibration Reduction) image stabilization provides 4 stops of blur free handheld shooting, assuring dramatically sharper still images and HD video capture. Nikon's innovations in optical design and lens technology have given way to a remarkable new class of NIKKOR lenses. The AF-S NIKKOR 80-400mm f/4.5-5.6G ED VR is among them. From its Silent Wave Motor (SWM) for ultra-fast, ultra-quiet autofocusing to its Extra-low Dispersion (ED) glass elements for maximum contrast and minimum lens flare and ghosting, you can expect a lifetime of consistent brilliant performance. 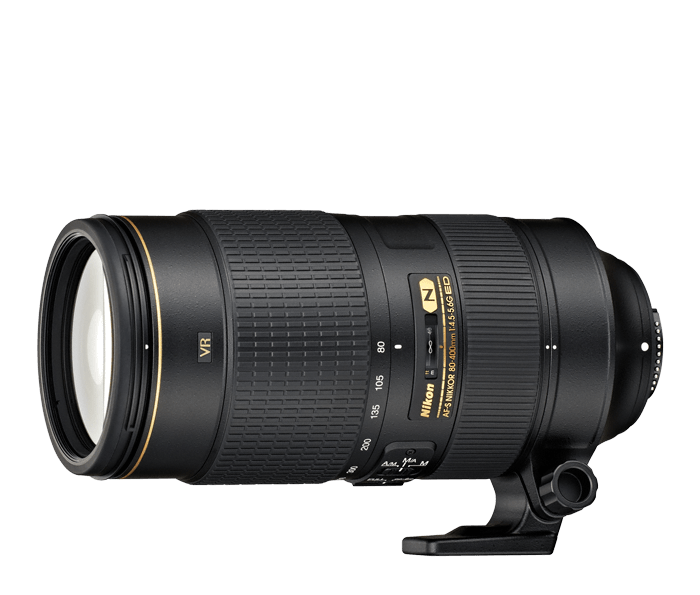 The AF-S NIKKOR 80-400mm f/4.5-5.6G ED VR is equally at home on DX- or FX-format Nikon cameras.